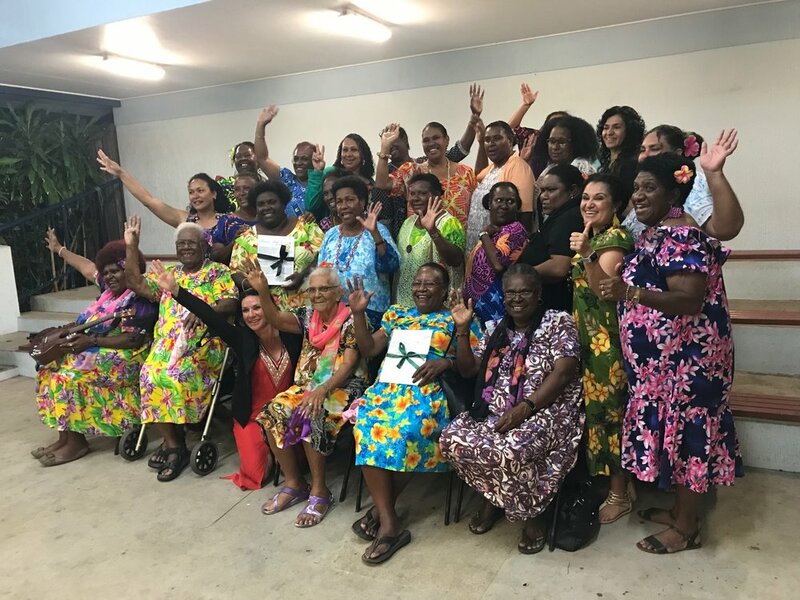 Over the weekend 16 – 18 November, around 120 women from the Torres Strait islands and mainland communities gathered on Thursday Island to celebrate the thirty years of service and achievement of Mura Kosker Sorority (MKS), the region’s peak women’s organisation, whose purpose is “protecting and promoting the rights of women, children and families”. Of One Mind partnered Mura Kosker in helping to develop this event as part of the Regional Voices program for WOW at 2018 supported by the Tim Fairfax Family Foundation and the Queensland Government through the Advancing Women in Business Strategy. Founded by a group of remarkably brave women who wanted to change things for women and children, today’s MKS also manages a range of key services – a women’s shelter, aged care, family and parenting support programs, and work with men at risk of, or involved in, domestic and family violence. The celebration (called Ipikaziw Garwoedhami, or “women’s gathering”), was an upbeat event of theatre, music, and dance as well as stimulating speakers and conversations, and workshops on fundamental issues for women: health and wellbeing, safety, creating employment and starting business, leadership. Arts practitioner Sasha Zarah worked with the MKS team and women on Thursday Island to curate this wonderful event. Highlights? The celebratory atmosphere and the performances took everyone into some challenging conversations. First Nation actor Tammy Anderson’s performance of her life story “I don’t want to play house” brought tears, and opened a chance for women to share their own stories of family violence. An outstanding panel of women pioneers, including Vonda Malone, the first woman Mayor of the Torres Strait, shared their experiences and philosophies for “stepping up”. And best of all – generations of women together, sharing each other’s company and stories, planning future action. And of course, the dancing – from the young women’s leadership group (Years 10, 11 and 12) who performed on Sunday, to the amazing founding mothers who were present, to cut the cake, and lead the action on the dance floor when the party really got going.